Over time, the role of the bathroom has gone from a purely functional space to a place of sanctuary within the home. It has become a place to unwind and sooth the soul with rest and water experiences. It's really no wonder that today's homeowners are working spa-like amenities into their bathroom remodeling plans. Over time, the role of the bathroom has gone from a purely functional space to a place of sanctuary within the home. It has become a place to unwind and soothe the soul with rest and water experiences. It's really no wonder that today's homeowners are working spa-like amenities into their bathroom remodeling plans. Keep in mind that luxury is more than just style. Luxury also means value. Consider some of the most luxurious materials on earth like gold, diamonds, and silver, which are not only visually appealing but incredibly durable. Since today's consumers are largely viewing their homes as a longer-term commitment, they're planning for spaces that will provide a luxury experience for many years to come. In Europe, people see spa time as such an essential part of overall health that employers and even the state often compensates for the cost through insurance subsidies. Stateside, spa visits are growing in popularity due largely to their stress reducing benefits. It's only natural that homeowners would want to create the same atmosphere in the convenience of their homes. Today, spacious upscale bathrooms often come equipped with features like radiant heated floors and frosted glass shower stalls. 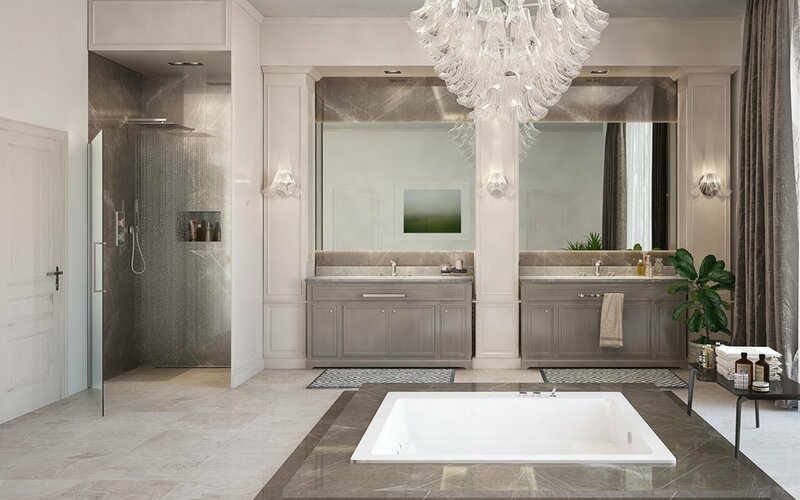 Since these luxury items have become somewhat commonplace, home designers are always looking for innovative ways to add spa-like comfort and beauty to bathrooms. Today, you can find a variety of bathing experiences from deep soaking tubs to bathtubs equipped with air jets, allowing you to enjoy the gentle massage of air bubbles. In fact, many of the bath technologies that we see in homes today originated in spas. For the homeowner who prefers showers to baths, there are also options for customizing a shower to get that spa feel. Various shower heads and bodysprays mounted on the walls and ceiling can create an at-home drench shower. You can even opt for electronic controls to orchestrate preset sprays, music, temperature, steam, and water usage. Put this all together and you get a personalized way to unwind from the stressors of the day. Anyone who has stayed at a luxury hotel or resort will tell you just how extravagant their bathrooms can be. Smart homeowners take notice of features and products at these establishments that tickle their fancy, noting every potential wish list item that they might want in their own bathroom. Items like plush chaise lounges and sculptural basin sinks are finding their way into bathrooms from luxury hotels. Classic wooden vanities and designer lighting are replacing run-of-the-mill medicine cabinets and cabinetry. Coffee lovers are even installing cappuccino makers right into the walls and cabinets! Homeowners who are remodeling their washrooms are also selecting materials and finishes that give their space aesthetic appeal, and also enhance long-term value. Gold finishes, polished natural stone, and handcrafted tiles are being used to create beautiful backdrops that are all at once lovely and durable. Glass is also an increasingly popular option for floors, sinks, counters, and other bathroom elements. Overall, it's a fresh alternative to traditional building materials. Gone are the days when the only way to listen to music in the shower was with an FM radio. Thanks to waterproof controls and speakers, you can now bring your own playlist into the shower with you. These days, it's almost the norm to install entire home theaters with flat-panel screens and sound systems in luxury bathrooms. And homeowners are coming up with creative methods of execution. Even if you have a limited home improvement budget, you can still take install the smaller flat screen televisions in a bathroom, tucking them away in the vanity when not in use. 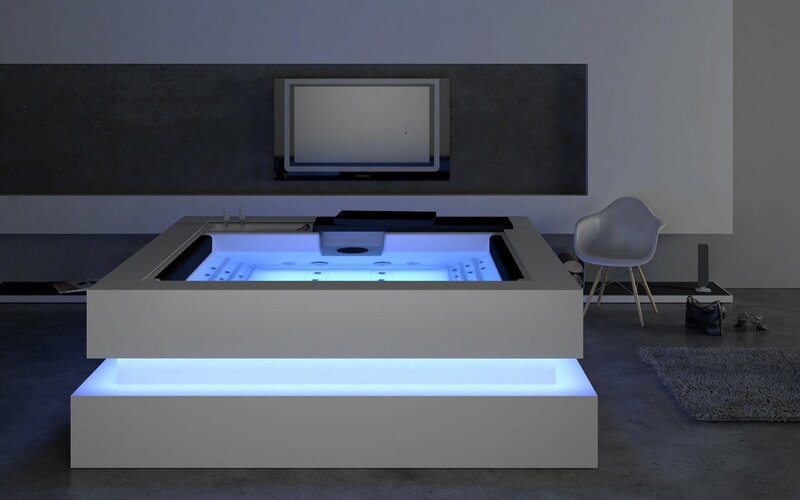 Wireless connections make this even more convenient by making it possible to watch movies, listen to music, and even browse the web while relaxing in the bathtub. Even if your budget is shoestring, you can still add luxuries to the bathroom in a small way, whether functional or purely aesthetic. These small additions can make a huge difference in your bathroom experience. Simply consider what you want most in your bathroom, and make those greatest wants your priority. For example, you might want to add a bidet to your bathroom, but decide that ambient floor heating is a bigger desire for you. It can be very satisfying to achieve your personal goal for creating the bathroom of your dreams. Just remember to create space in your remodeling plans for additions that will serve you in the long run. When you plan ahead and explore all of your options, you will certainly be on your way to having your dream bath.